NORTHWEST PASSAGE was a pretty rough go in 1940, with some bloody (for the time) mayhem, grisly descriptions of torture and implied (not shown) cannibalism. Today, what stands out more uneasily than the gore is the glee. It’s got to be one of the more difficult movies for Native Americans to deal with, as it pretty much celebrates wiping out the Abenaki tribe during the French and Indian War. The ‘good guys’ are ‘Roger’s Rangers’, who assumed legendary proportions over generations of mythologizing the frontier. This is interesting in that the historical record shows that Robert Rogers was keen to embellish his exploits (and dodge conviction for counterfeiting), then decided to change his stripes a few years later to fight for Britain against his fellow Americans during the Revolution. Whoops. If you ignore the racism (blatant even back then), and figure the actions of the characters as likely an accurate enough reflection of how brutal those old inter-racial battles were, then you can—depending on your sensitivity or inclination— iron out the viewing experience into one where you suspend judgement of content in favor of context and just look at how well they put the show together. Or not. Basically, it’s a brazen adventure epic that makes you feel queasy. Fourteen different writers worked on the script, fashioned out of the 1936 Kenneth Roberts novel. MGM poured nearly $2,700,000 into arduous location shooting in the wilds of the Oregon Cascades and Idaho’s Payette Lake Wilderness, doubling for long ago New York. It was a hit, coming in at 7th place for the year, though it didn’t make enough recoup its outlay: as such the planned second part was cancelled. 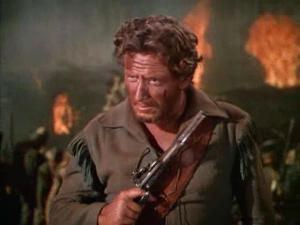 Spencer Tracy does his usual forceful job as Rogers; Robert Young and Walter Brennan are fine in support. It looks great in color, and is noted for several stunning action sequences. First is a segment where a dozen rowboats are portaged over a steep hill: it really looks like a knuckle breaker. Second is a ‘you’re joking’ crossing of a raging river where the cast (no stunt doubles) link arms and help each other in a line from one side of the torrent to another—pretty wild stuff—and it must have been freezing. Third is a boiling, vicious decimation and burning of a large Abenaki village. Quite impressive in its staging along with being fairly stunning in its savagery. Of course, if you made an accurate detailing of a Native American attack on colonists, say the 1813 Fort Mims massacre of six hundred men, women and children (to pick just one), audiences could not begin to stomach the details. Not ever going to happen, as history has taken a revision in its telling, and it’s uncomfortable for todays liberal-leaning viewers to go to a place like that. There was enough carnage going around back then to smear everyone (no, that doesn’t excuse the invitation extended to the audience to applaud the slaughter). Directed by King Vidor, the 125 minute film was Oscar nominated for Cinematography, and features Ruth Hussey, Nat Pendleton, Donald MacBride, Regis Toomey, Ray Teal— and Addison Richards as the literally man-hungry Lt.Crofton, who keeps the severed head of an Abenaki in a sack– to munch on-–hey, I told you it was nasty.